A few weeks ago I had an experience in nature that was very spiritually significant to me. On a particular saturday morning I was prepared to paint my second "quad" painting (a painting composed of 4 stretched canvas sections due to its size - each section is 54' wide x 88' high totaling about 9' x 15'). I was planning to start this painting during the morning; in mid afternoon go with my wife to the celebration memorial of a very mature, righteous, man of Yahweh; and return to my studio/home to continue painting. I followed this schedule and, returning home from the celebration slowly driving down our long dirt driveway, we passed a peach tree I have not done anything with for many years. I was driving and the tree was on my wife's passenger side of the road. My wife was glancing at this peach tree and suddenly asked if I saw the peach. I said "no" and she said "stop", so I did. We got out and walked under the peach tree, looking up at one fully formed, very large, beautiful ripe peach. You might say, " Well, of course - it was a peach tree". But it was the only peach on the whole tree. There was no evidence of there having been any other peaches at all on this tree or on the ground below. Just one and it was just about to drop. So I reached a branch above my head and pulled on it to get the branch with the peach low enough to remove the peach. I handed it to my wife and she asked if I wanted some of it as we re-entered the car and began to drive on home. I said no, go ahead. Because I was paying attention to the driveway I just assumed she progressed to eat the peach. Later in the house I went to the kitchen and opened the refrigerator and found half of the peach in a cup. I picked it up and ate it. It was absolutely the most ripe, sweet, tender, delicious peach I have ever eaten. I have told this story to a few people and one person said there haven't been any peaches in NW Arkansas this year because of the timing of a freeze in the Spring. So what is the point of this story? To begin with as I saw this amazing solitary peach and realized my wife just saw it because she was the passenger and not driving and "happened" to look up at just the right moment to see this peach, which was virtually buried in the leaves - I knew this was very spiritually prophetic (revealing) of something significant for us to know. The rest of that day's story is I returned to paint on this quad painting, and before I quit for the night I realized this was becoming a very unusual and strong painting at the end of a very unusual day. I finished the painting a few days later and yes it is a very unusual and strong painting - it is just as if Yahweh is saying, " ... here is something in my heart and mind and now I have been able to fully give it to you to manifest". I had (still am) been standing in the gap interceding heavily for several couples with impossible relationship problems. To see this one beautiful fruit on that tree and realize Yahweh caused both of us to find and harvest and eat it caused me to remember Yahweh is the Being of cycles evidenced in His Creation - He doesn't plow forever but brings to the moment of birth and brings delivery. Faith walking with Yahweh is full of such cycles. The bearing of fruit that remains, that is rich in substance and perpetual in purpose, is the harvest end of the cycle that starts with faithfully plowing, preparing, planting, cultivating, waiting. So I received this prophetic peach as an encouragement that I was entering a season of harvesting the fruit of long days of intercessory labor. I wanted to establish an "ebenezer" to commemorate this remarkable weekend, so I called this painting "onepeachykeeniris". Yahweh brought this peach to us at just the right moment, a ripened condition right before it would drop to the ground, so we could have it and it not be wasted - He has a perfect timing for His anointing to be release through us so it will find a good environment to flourish in and not "spill out on the ground and be wasted". Yahweh's Word (dreams, visions, assignments, purposes desires) won't return to him empty. Darnéy "onepeachykeeniris" 2018 176.5" x 104"
​This work, “healingirises”, is a large-scale triptych of three different views of the iris flower. In the late spring/early summer of 2002 I received a commission from the Washington Regional Medical Center in Fayetteville, Arkansas, to paint a work as part of the collection they were acquiring for their new facility. The three canvases were painted with acrylic paint on stretched cotton. The left panel is 78” x 96”. The center panel is 90” x 120”. The right panel is 78” x 96”. When I went to see the site, the facility, I prayed for an idea or a vision, because I new the committee would ask me for one. When they showed me this one particular large waiting area that had about a 40 foot long wall lit with a bank of north windows, I knew this was the space and sure enough they asked me what I “saw”. I saw three large canvases of irises in natural colors of blues, greens and purples. Iris flowers were a strong current interest of mine, but what was different about this piece was the colors were going to be more “natural” than invented, and the viewpoint approach would be different than I had been working. The left canvas is a middle distance view of a garden of irises. Several iris flowers with their green stems are in the viewing area. left panel 78" x 96"
​The right canvas is a close up view of one large iris and a couple of smaller ones are seen behind it. right panel 78" x 96"
​The center canvas is a macro close up view into the flower. It is zoomed in so close not all of its outside contours or edges are seen. center panel 90" x 120"
​Even though this center view is like the views I mostly worked with before this commission, I believed it would be better to help the viewer adjust to this perspective by giving them a progressive experience from a more traditional viewpoint to this more extreme type of view. The philosophical statement I submitted to the Medical Center included “… these flower images are meant to be more than mere visual illusions or mimics of iris flowers – they are intended to be metaphors or doorways into visual, emotional, and sometimes even spiritual journeys into flowerscapes of peace, order, beauty, and unity. They are metaphors of the human condition, of the magnificent yet fragile nature of our humanity and our constant dependence on our Creator for inspiration, protection, nurturing, and restoration”. The Kingdom of our Creator is described as right order (righteousness) peace and joy. I like to work with “precarious order” a dynamic balance between order on the one hand and chaos on the other. I believe when this is achieved I can produce a visually presented peace and impart the potential of inner peace to the viewer. In a world so full of outer turmoil, this quality of life is very valuable. When it is obtained it can result in great expression of joy, or joyful celebration. ​I paint large scale canvases with bold invented color - lyrical and very expressive color passages of natural images viewed so very close up only part of the external contours of the particular mages are seen. I don't use the internal natural details normally seen with such a view. Currently I am painting flower images, mainly from the iris flower. These images are meant to be more than visual illusions or mimics of iris flowers - they are intended to be metaphors or doorways into visual, emotional, and sometimes even spiritual journeys - into flowerscapes of peace, order, beauty, and unity. They are metaphors of the human condition, of the magnificent yet fragile nature of our humanity and our constant dependence on our Creator for inspiration, protection, nurturing, and restoration. I realize humans are capable of extremely ugly horrible cruel things also, which is worth addressing in paint as well. Presently my work is both a joyful celebration of living, having purpose on this earth, and bearing fruit and also addressing issues that arise on the earth from mankind leaving an intimate relationship with our Creator and thus mismanaging our stewardship of the earth. The Kingdom of our Creator is described as right order (righteousness), peace, and joy. When I paint I seek what I call precarious or dynamic balance between order on the one hand and chaos on the other. I believe when this is achieved it produces a visually presented peace and can help prepare the viewer to receive inner peace. In a world so full of inner and outer turmoil, this quality of life is very valuable and when obtained can result in great expression of joy, or joyful celebration. I can describe my formal interest in strong edges or exterior contours of objects in nature, especially the iris flower, in spiritual terms: the edges are apostolic boundaries and the content within them is prophetic expression. This is like the thought of King David of Israel: “the lines have been drawn for us in pleasant places”. From the beginning of painting in this manner I have valued the two dimensional nature of the canvas and considered the formal balancing of relationships of color areas, shapes, values just as strong a purpose as presenting the subject concept. Recently I have begun to see that holding the intrinsic nature of painting on a two dimensional surface as valuable in itself seems to be an issue of integrity. Just as it might make sense to expect that a vessel be used to contain some substance, it seems right that a flat surface used for presenting visual elements not be expected to be used to create an illusion of natural spatial depth. Using the surface to present formal spatial depth could lead to the essence experience of natural spatial depth or the viewer’s experience with natural spatial depth could lead to formal encounter of spatial depth on a canvas. Allowing the flat surface of canvas or paper to live independently of artificial allusions of illustrating natural representation gives the artist the freedom to explore the essence of natural experience. I once was working as a house painter and was working on a many paned bay window. I became aware that each of these panes was one of my 6 x 8 foot canvases. In front of me I could see one large multi-paneled piece. The idea of many panels has intrigued me ever since. 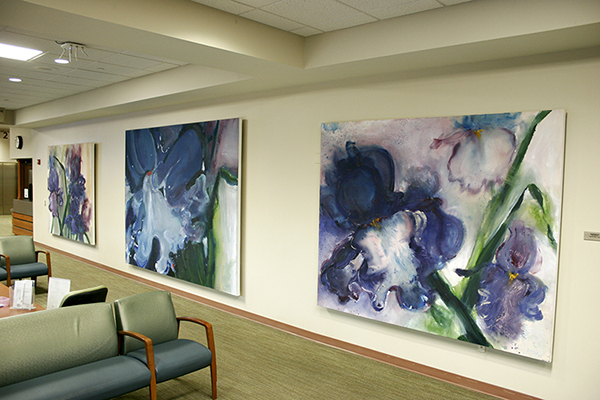 The commission for Washington Regional was a triptych. I have been recently thinking more about what is significant to me about this and realize the metaphor of a window means a couple of things to me. For one it reminds me of Apostle Paul saying in the New Testament of the Christian Bible that we see in a glass dimly, realizing our limited ability in understanding some of the mysteries of life. The other idea is related to the notion that seemed to exist even in Roman art and later in Renaissance pretty much until Cezanne. That is painting about nature as if one were looking through a window out at it. With that idea of looking through the window, devices were developed such as spatial depth and picture plane illusionistic portrayal of one frozen moment in one’s observation of something that is, ironically, not frozen but quite alive. Because I like to treat the painting surface as a flat surface and enjoy formal relationships of picture depth with or without reference to natural illusion, it occurs to me how fitting it is to use the canvas not as something one has looked through a window to see, but something that is a window one looks at to look at nature through or to look deeper into nature, life. This certainly can be approached with a single canvas, but the use of multiple canvases in a single piece enhances the metaphoric quality of it. ​A few days ago I finished my most recent painting. 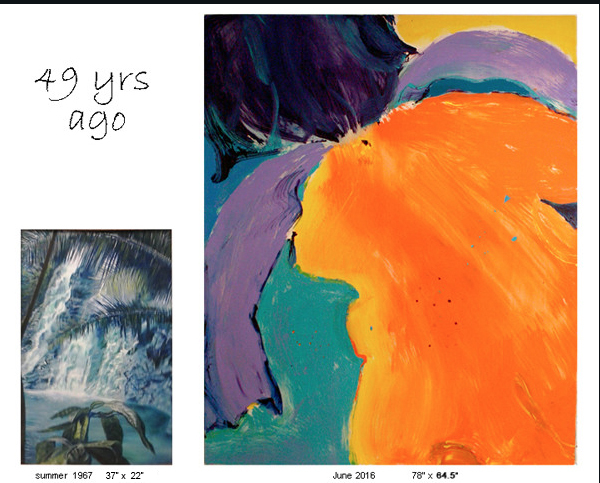 As I was looking at it I realized I began a serious pursuit of understanding visual art and developing a gift in painting in the summer of 1967, probably this very month. As you can see from the photo of the painting on the left above, I started out trying to paint as faithful to what I could see, concerning organic objects from nature. I suppose this makes sense for one working in a visual medium like painting, since we are trying to understand what we are “seeing”. But “seeing” depends on why we are looking. If I am only interested in the physical appearance or anatomy of the object, like a plant, certainly an accurate representation of that object seams to make sense. Colloquially, people tend to call this kind of painting “realism”. Another term, maybe more suited could be “naturalism”, referring to what is seen in nature. If one uses “realism” in referring to accurate descriptive painting of objects from “organic” (non-manmade) nature, I think one needs to realize to begin with: painting is a 2-D (dimensional) medium. It only operates in the width and height dimensions. A painter can only imply or suggest the third dimension of “depth” or the fourth dimension of ”time”. These formal (technical) issues of principles of composition create a very strong problem with what one experiences in nature. Very few things in the visible world of nature are purely flat and nothing in nature is totally still. Organic things that are alive are full of movement and dead things are decomposing. We instinctively know, sense, this. So this creates quite a challenge for painters to not only satisfy their own understanding of what they see but to offer convincing images of nature to others. I am going to plan to discuss this issue of painting in “realism” in much more depth in another post, but for now I am celebrating this memory reminder of beginning this visual art journey 49 years ago. As you can see today I am not painting in the same approach that I started out in, as evidenced by the image of the painting on the right above. I am still referencing elements from organic objects in nature, but not choosing to be as faithful as possible to anatomical details, 3 -D properties, or local color (color seen in the object I am working from). Looking at what was probably my first “plant” painting suggests I possessed the skills to be able to develop quite an accurate, convincing ability to paint organic nature in probably a photo-realistic approach. Apparently I have chosen a different path as my reason for “seeing” has also developed over the years. I am planning to discuss this in a future post as well. other. I believe when this is achieved it produces a visually presented peace and can help prepare the viewer to receive inner peace. In a world so full of inner and outer turmoil, this quality of life is very valuable and when obtained can result in great expression of joy, or joyful celebration. prophetic expression. This is like the thought of King David of Israel: “the lines have been drawn for us in pleasant places”. integrity. Just as it might make sense to expect that a vessel be used to contain some substance, it seems right that a flat surface used for presenting visual elements not be expected to be used to create an illusion of natural spatial depth. Using the surface to present formal spatial depth could lead to the essence experience of natural spatial depth or the viewer’s experience with natural spatial depth could lead to formal encounter of spatial depth on a canvas. Allowing the flat surface of canvas or paper to live independently of artificial allusions of illustrating natural representation gives the artist the freedom to explore the essence of natural experience.